Isis, the joint mobile payment venture between Verizon (s vz), AT&T (s t) and T-Mobile, has often been cast as the tortoise, compared to Google Wallet’s (s goog) hare. 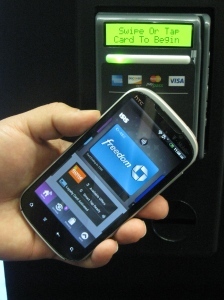 While Google Wallet, a system based on near field communication, got a splashy introduction almost a year ago and formally launched in September, Isis’ competing NFC technology continues its slow march toward a pilot test in two cities this summer with no firm word on further rollouts. But after some of the early struggles of Google Wallet, some of it caused by Isis members, the wisdom of Isis’ slow-and-go approach is becoming more evident over time. It’s not surprising considering the heritage of Isis’ main backers, big telcos that are used to providing high reliability while Google is known for its fast beta cycles and rapid prototyping. Even with Isis’ methodical march — in which it has lined up an impressive number of partners — it’s still not expecting to change the game in one fell swoop. “We’re not trying to hit a home run, but get a bunt single,” said Isis chief marketing officer Ryan Hughes. I sat down with Hughes this week to talk about Isis and get a sense of how it expects to make its mark on mobile payments. He said the goal is to plan for a long term success, but launch with a compelling platform that appeals to consumers, banks, merchants, credit card companies and the carriers. That’s been where the company has spent its time, crafting a system that adds value to all the players in the game. It’s lined up deals with the four major credit card companies: Visa (s v), MasterCard (s ma), American Express (s axp) and Discover (s dfs). It’s gotten the support of six major handset makers. And more recently, it partnered with big point-of-sale system providers and announced financial institutions Chase, Capital One and Barclaycard will place their credit, debit and pre-paid cards in the Isis wallet. The deals with the banks are critical, giving Isis access to about 50 percent of all consumers in the U.S.
That’s in contrast to Google Wallet, that launched with MasterCard initially and with Citibank (s c) as its only banking partner. As I’ve written before, the banks are a critical component because they have a trusted relationship with consumers. Isis has done a lot of work to court them and you can see it in the Isis mobile app, which got formally demoed at South by Southwest. The Isis wallet app lets the banks insert their cards into a widget-like sandbox, that connects directly into their servers, so Isis doesn’t see any of the data. That not only earns the banks’ trust but also allows them to add more banking services right into the Isis app, so users can check their balances, pay bills and get rewards from wallet, too. That’s indicative of Isis’ approach here. As Hughes says, Isis isn’t looking to disintermediate anyone, but provide a neutral platform. “We don’t want the data or a portion of the rewards. We’re a technology service provider,” he said. That’s in contrast to Google, which wants to gather customer data to better provide mobile ads and offers. Google has reportedly been rethinking its strategy in the face of struggles to get traction and is reportedly considering sharing revenue with carriers to get them to buy in. For now, Isis plans to make its money from the card issuers, though Hughes doesn’t say exactly how the business model works. Isis’ role as a joint-venture between three major carriers has also been a barrier for Google Wallet, which is still only aligned with Sprint (s s). Google has struggled to get Google Wallet on more than a couple of phones though more Sprint NFC-enabled devices are on their way. Hughes said as the owner of the secure element on its phones that will host the payment credentials for NFC-based payments, Isis is in a position to offer banks the security of knowing their cards are safe on phones. Right now, he said there still aren’t standards for deciding how multiple apps can access the NFC secure element. There’s a question of how to handle multiple NFC badges that co-exist on a phone, he said, though there is an option for phones to support non-secure NFC payments with the card stored in the cloud, not on the phone. As Isis prepares for its summer launch in Salt Lake City and Austin, Texas, it’s still in B2B mode, lining up more partners. The goal, said Hughes, is to make sure that when consumers finally get their hands on their wallet, there’s as many familiar cards and retailers working with the service as possible. But as the platform gets poised for launch, Isis will assume a bigger role as the unifying brand, helping enable mobile payments, said Hughes. Toward that end, Isis will be offering some free money to try out the service for early users. And it will also be working on a system by which users can clip Isis coupons online and attach them to their wallet, similar to how Facebook Likes are used on the web. Isis won’t be offering location-based offers at the start but Hughes said this clipping mechanism will be a key way in which merchants are able to provide offers to consumers. I still have my reservations about how fast an NFC-based system can grow based on the limitations of NFC-enabled terminals and handsets. Isis is not saying how many phones will support the mobile wallet initially. Hughes did said 25 percent of the top 100 merchants have NFC-enabled point-of-sale terminals or are in the process of deploying them. To take full advantage of Isis, merchants will also have to enable their terminals to support Isis’ SmartTap system, in which users can apply loyalty cards and offers during a transaction. That requires some software integration work. But as Hughes points out, Isis isn’t looking to win this game in the first inning. The joint venture is taking a measured approach and will be just happy getting on base initially, giving people a clear sense that Isis is a viable contender. A lot more work needs to be done, but the carriers seem to be prepared to take the necessary steps to make it all happen. The carriers’ DNA is more similar to the banks in that they have direct financial relationship with consumers and fear the potential dangers of having a payment system that doesn’t work. While the operators have been derided in the past for their plodding ways, this might be what it takes to win in mobile payments. I agree with the overall assessment: you’re unlikely to win in multi-sided industry like payments without a strategy that offers something to all of the major players (or at the very least doesn’t threaten to cut them out). Google shouldn’t take much solace in having Sprint as a partner; at this point I think they’re willing to make a lot of gambles that won’t appeal to other carriers. That said, I would definitely advise against letting marketer’s metaphors find their way directly into your writing (last paragraph, first two sentences). It’s definitely a balanced article, but when you use some of a marketer’s words it can make the perspective seem skewed.